The Minicom by Tripplite 0SU70068 is a product bundle which includes the Minicom by Tripplite Power on Cable (PoC) and the Minicom by Tripplite PX USB KVM IP Gateway. The Minicom by Tripplite Power on Cable (PoC) is a single port power control (SPPC) device that enables remote power control (power on/off/reboot) of any connected device. The PoC is complementary to Minicom by Tripplite's line of OOB remote KVM access solutions, which together provide the complete remote support package. 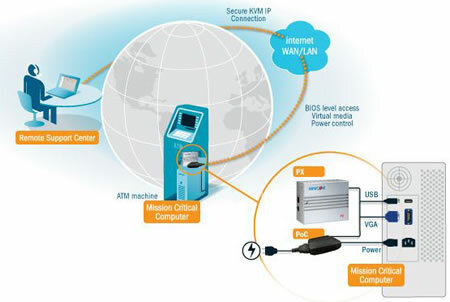 The PoC is serially controlled via a Minicom by Tripplite KVM IP gateway thus preventing costly mistakes and ensuring the power commands are sent only to the required device. Click here for more details and specifications for the Minicom by Tripplite Power on Cable. The Minicom by Tripplite PX USB 0SU70028 is a high performance KVM IP Gateway which provides complete BIOS level access and control of your computer or server, from any location. The compact PX comes with 128-bit SSL security as standard, and is equally adept in small business environments, remote support applications, and Enterprise data centers. Click here for more details and specifications for the Minicom by Tripplite PX USB.